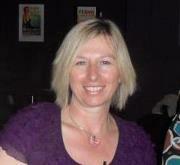 We are delighted to have the lovely and so supportive author, Nicky Wells, with us today for a chat. Hi Nicky, thanks for dropping by. First of all can we congratulate you on your SECOND book deal with American publishers, Sapphire Star Publishing – that’s fantastic news. Okay, let’s start with Sophie’s Turn which began life as a self-published novel but was soon snapped up by your publishers. Can you tell us a bit about it? I write Romance That Rocks Your World! More specifically, I write contemporary romantic comedy featuring a rock star and the girl next door. 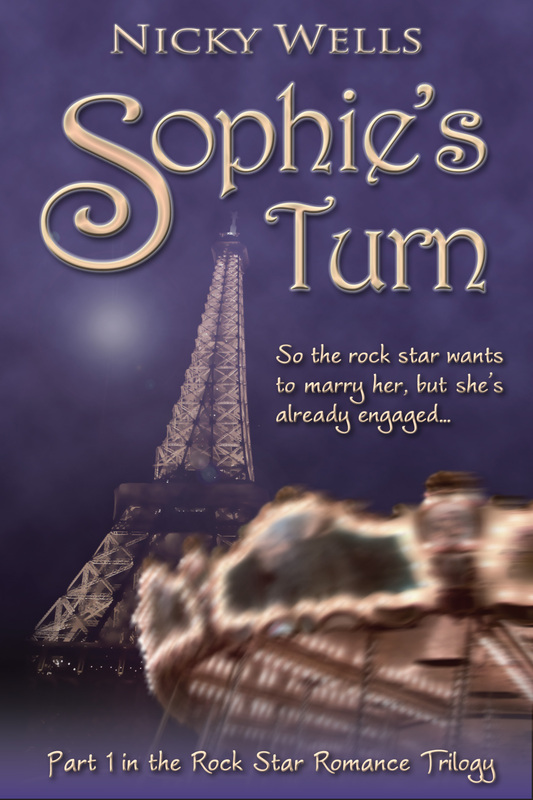 My debut novel, Sophie’s Turn, introduces rock star Dan and girl-next-door Sophie. Here’s the story in a nutshell: One fine day in Paris, Sophie Penhalligan suddenly finds herself engaged to her teenage crush and love-of-her-life-from-a-distance, rock singer and star extraordinaire Dan Hunter. But there is the small matter of her very recent, but very prior, engagement to Tim. Reliable, honest, trusting Tim, her boyfriend of two years stashed away safely in his mews house in South Kensington while Sophie is drinking rather too much champagne with Dan in Paris. This contemporary romantic fairy tale describes how Sophie gets into her impossible situation and how she turns it around. Sophie’s Turn will be published by Sapphire Star Publishing on 6 September 2012, and I’m telling you, I’m counting the days! Now, Sophie’s Turn can be read as a stand-alone but it is part of a trilogy, isn’t it? Did you plan it this way? Funnily enough, even though I had initially set out to write only one book, Sophie’s Turn, I knew even before I finished writing that there would be a second novel. Sophie’s story simply wasn’t finished when I got to the end of the book. Therefore, shortly after releasing Sophie’s Turn for its initial publication through Kindle, I set about writing The Sequel. Titled Sophie’s Run, the sequel picks Sophie’s story up right from the end of Sophie’s Turn. Dan continues to be a huge part of Sophie’s life, as does Rachel. Moreover, there will be a couple of new characters to spice matters up! There will be rock themes and weddings (yes, plural) and all manner of twists and turns that will keep you turning the pages through the night again. I’ll tell you a bit more about that when the first book is launched. However, I can tell you that Sapphire Star Publishing has also signed Sophie’s Run and the book is due for release on 7 February 2013! Have you started planning the final one yet? I have! 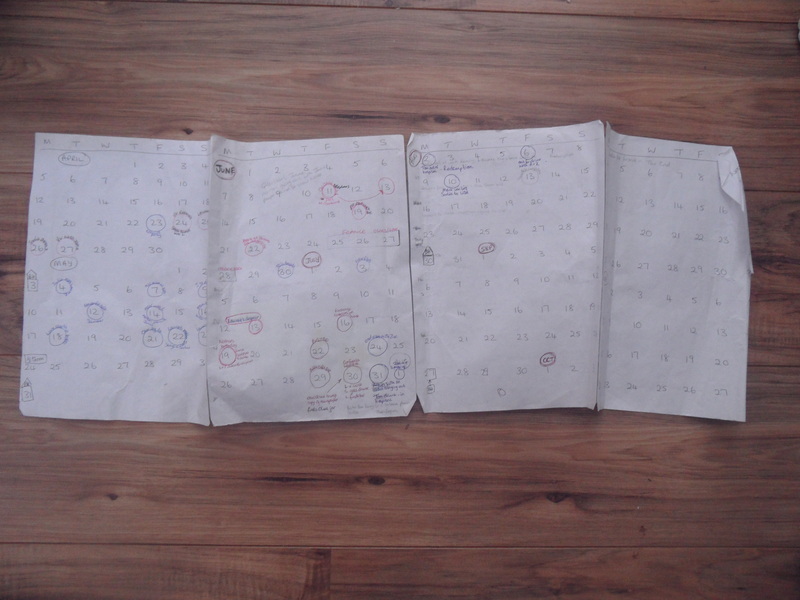 I drew out the one-page hand-written masterplan on Valentine’s day (on a train, actually), and I have just done my typical huge plot flowchart involving a 2m length of paper, coloured sticky notes, and many arrows. My goal is to have my concept and plan completely finished by the start of September so that I can start writing the final book in the Trilogy as soon as the boys return to school after the summer holidays! How have you seen your heroine Sophie develop over the two books? Has she changed? Were these planned or has she taken on a life of her own? That’s such an interesting question! You may not know that seven years elapsed between the writing of Sophie’s Turn and the sequel, Sophie’s Run. Needless to say, I grew and developed in that time, not least through having two kids! Having just reread myself both books in sequence in quick succession, I am thrilled to note that the story continues seamlessly; you’ll definitely recognise the Sophie that you know and love from one book to the next. However, she has grown as a person. I feel that she has become more grounded. Her view of life and her expectation of love and relationship have become simultaneously greater (she wants the real deal, and only the real deal, a thunderbolt-and-lighting moment) and more realistic. She has been promoted at work, and she has bought her flat, so she has taken on more and more ‘adult’ responsibilities. Naturally, though, she does maintain her close friendship with Dan. We mentioned earlier that you started off self-publishing, how does working with Sapphire Star differ? Wow, where to start? I think the biggest change is that I’m no longer working alone in building a platform, a readership, and writing career for myself. I have a team of professionals standing beside me, pulling in the same direction and shooting for the same goals. I can tell you that everybody at Sapphire Star is very passionate about books; it’s a whole new world of experience for me! I can ask a thousand questions (and I have!) and I receive guidance at every step of the way. Where my ‘indie’ launch occurred in a frantic time of confusion and incremental (read, on-the-hop) strategy making, the launch for Sophie’s Turn involves clear action steps that I have to accomplish by a certain time. This takes away a lot of the uncertainty and gives a fabulous focus. Just last week, I had my official cover reveal, and it is a fantastic knowing that very soon it will be gracing an actual book. Also last week I received my first ever publisher edits, which I opened and digested with some trepidation. I needn’t have worried! The editor offered a series of comments and suggestions that have helped me sharpen and tighten parts of the narrative. Obviously, I have edited Sophie’s Turn many times before, using input from a cadre of beta-readers and, later, proofreaders. Yet it is only now, under the gentle and targeted guidance of a professional editor, that I’m finding the courage to tweak and hone and polish. I am really excited by the outcome! You are always so busy, how do you manage everything? Do you have a writing routine and more importantly do you stick to it? While I am writing a novel, the actual writing time is sacrosanct. I don’t answer the phone, I don’t order any shopping to be delivered, I don’t even open the front door. If I don’t safeguard those time slots, time will run away with me. Everything else has to take second seat. If you didn’t write, what would you do instead? I have recently retrained as a teaching assistant and have greatly enjoyed working as such on a volunteer basis in my local primary school. It gives me a great buzz to work with small groups of children and facilitate their learning, perhaps catch them up or build bridges that are difficult to create in a classroom context. As a result, you get to share in a lot of ‘aha’ moments, and that’s a wonderful feeling. If I wasn’t writing, I would probably seek full time employment as a teaching assistant or possibly consider training as a teacher. What are your writing dreams/aspirations? Do you ever see yourself moving into another genre? At one level, my writing dream is to touch people’s lives, make them smile or think about their choices. At a more practical level, my dream would be to build writing in a sustainable career, in every respect. I am working very hard indeed to make that happen! Could I move into another genre? Well, I’m a rock’n’roll romance girl at heart, but I could see myself writing children’s fiction. I also have a couple of darker, more literary novels in the works although I would probably write those under a pen name… But fear not, whatever I do, I’ll be bringing you my own unique brand of romance that rocks your world for many more books to come! Thank you so much for hosting me on your fabulous blog today, it’s been a real pleasure and a privilege being here! No, thank you! It’s been great having you here, Nicky. Your enthusiasm is infectious! The conservatory? The office? The kitchen table? Most of us on the whole use electronic devices although sometimes doing it the old fashioned way does get the creative juices flowing. 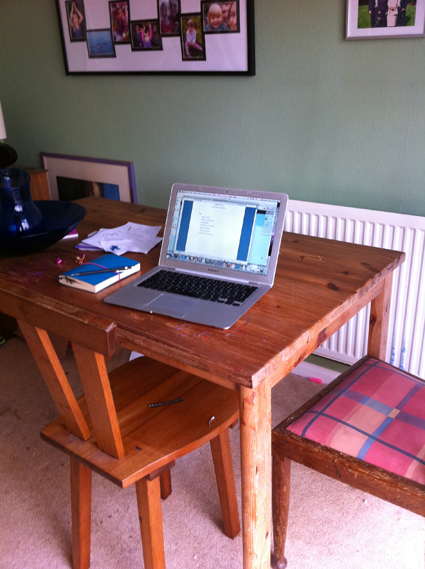 We’re talking writing spaces and thought we’d share our corners of creation with you. Would love to know where you get creative! Sue : Although I have a perfectly good desk, I am really a kitchen table kind of girl. 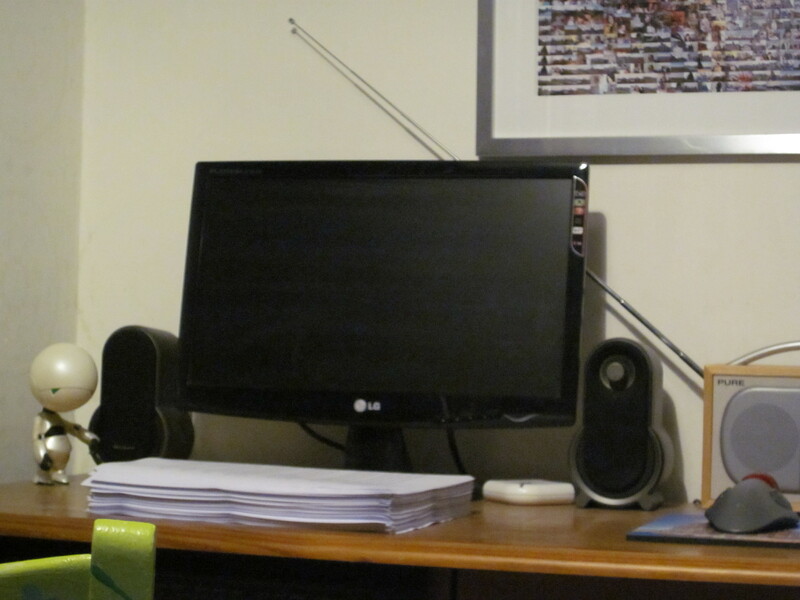 As my desk happens to be right under the TV, if anyone wants to watch it, I have to move. 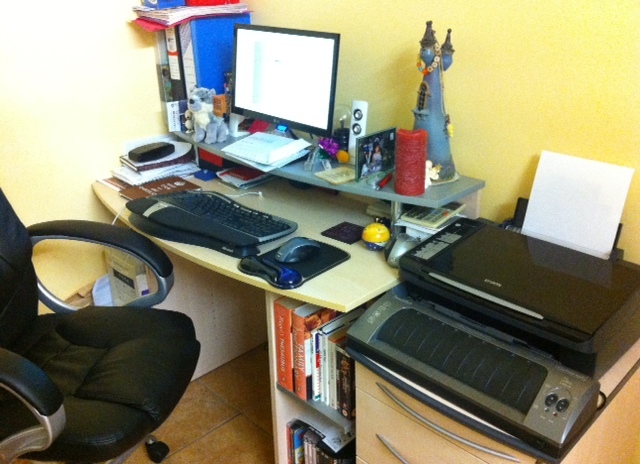 In the spirit of honesty, I would just point out that I tidied my desk before I took this photo. 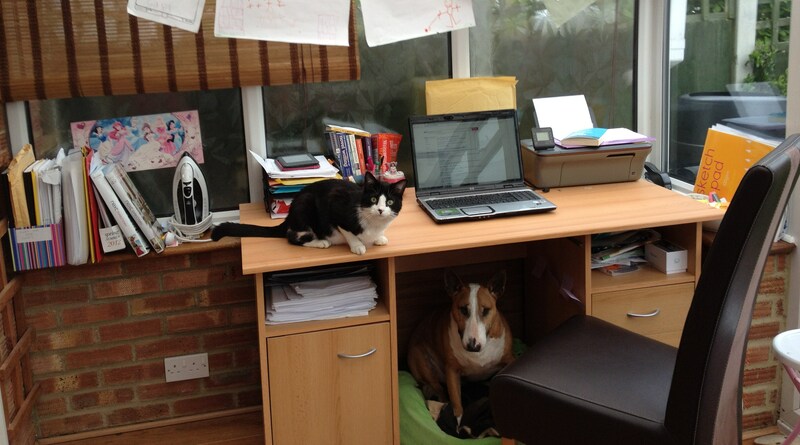 Catherine : I normally work on my laptop which would be sat where the manuscript is. When not working from my desk I’m on the sofa downstairs. 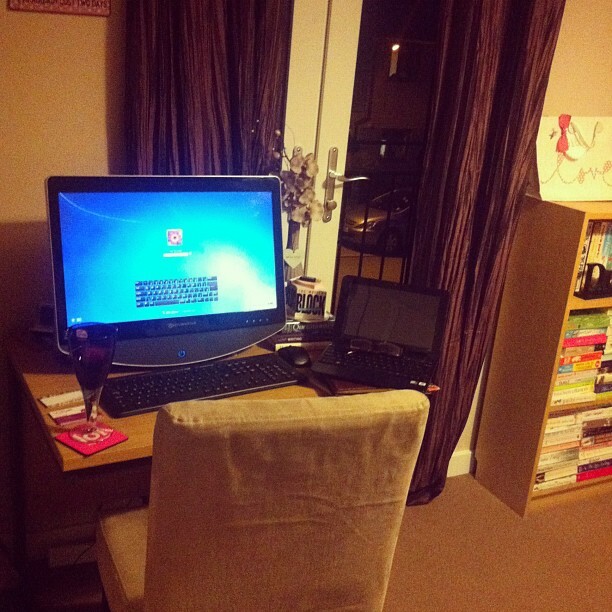 It all depends what time of day it is and how tidy the bedroom is so I can get to my desk! Celia: This old table arrived with Mr A when he moved in – part of his dowry, I think, along with a really good egg whisk, some posh casserole dishes and about a million books (no goats, sheep or cattle though). I write here because it’s slap bang in the middle of the house and I’m incredibly nosy. Shut me away and I would die of boredom. I can see the ducks on the pond next door and monitor what’s going on in the street. It’s also quite near to the place where cake lives. Laura : My desk and the BIG chair reside in the kitchen. It doesn’t always look like this – it is a scene of constant movement depending on what’s happening in my life. Lots of paperwork at the moment. I have Suma, the wolf, from Jodi Picoult, and small mementoes from my children and my mum to keep me company when my characters walk off in a strop. Jan : My desk is in the corner of our little dining room/come office, surrounded by inspirational wall posts, quotes, symbols, starsign predictions and funny pics to make me smile on down days or when the the old writer’s block thwarts the flow. I also have my three little ‘gonks’ as I call them to keep me company which, as you can see, reside on the base of my PC. Yes, I am a big kid and make no apology for it! 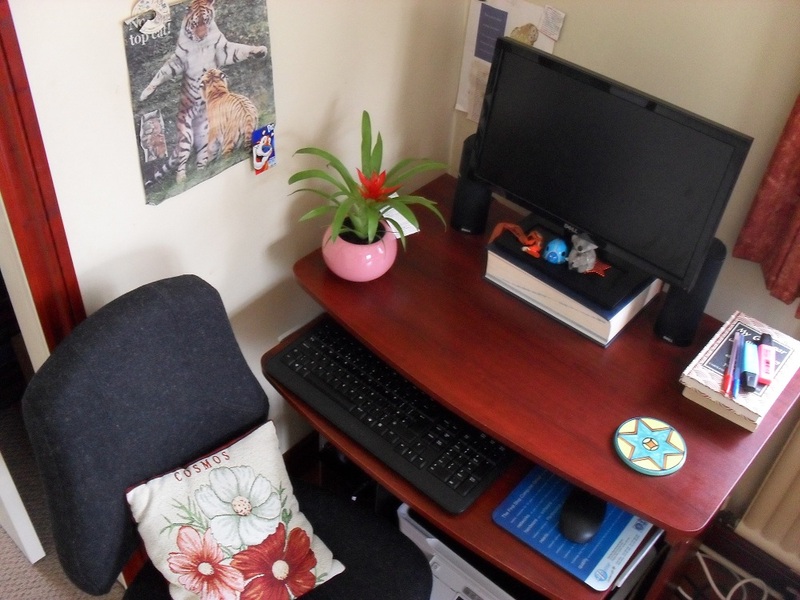 My plant provides an added splash of colour and my grammar book, dictionary and thesaurus are never far from view. Last but not least, my cosmos cushion gives me that little extra padding for those marathon – into the night – writing stints. 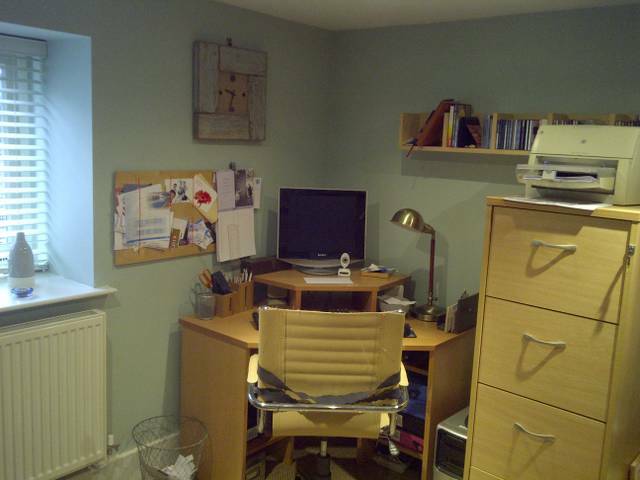 Debbie: The study was always the ex’s den and he spent hours in there (we probably know why now ;)) I admit, I could never see the appeal, but since he’s left, I’ve tried to change all the rooms around; decor and layout wise, to make them my own. And for me, I tend to do most of my writing in the kitchen at the island. 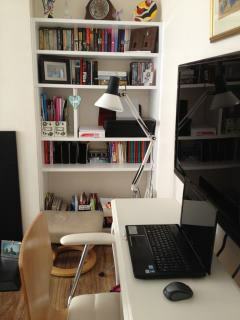 However, my study is now a haven where I can disappear if the boys Wii or music gets too loud. I’ve also made it more of a library/study space as well as a 4th bedroom if anyone comes to stay. 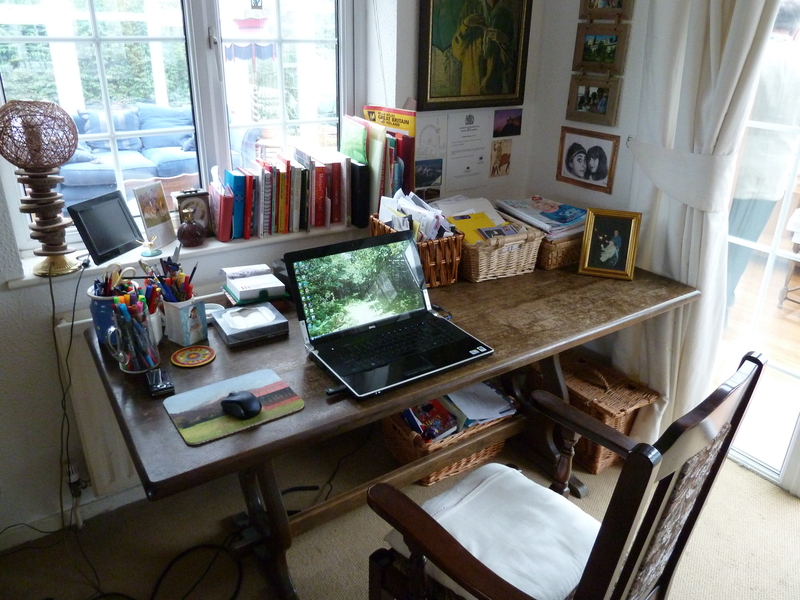 Lucie : My writing space is fairly new to me as I used to write upstairs in the spare bedroom. However, I was finding being locked away upstairs on a daily basis a little boring and it was reflecting on the amount of work I was getting done. I would regularly bring my laptop downstairs and write on the dining table. So I took the plunge and moved my desk downstairs. Now I share the conservatory with LO’s playroom. This side of the room is pretty tidy and ordered but if you swing the camera 180 degrees then you will see a mass of toys, a children’s kitchen, an easel, Barbie doll house and storage boxes. 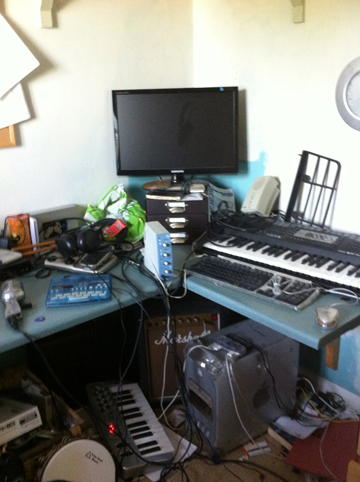 But noone will ever know – because I refuse to take a picture of that half of the room! Quite fitting with the English weather at present, I find it very therapeutic when it rains – I love listening to the raindrops on the conservatory roof. But I do find that when it is a very sunny day, I get a lot of glare on the screen so I shift into the dining room and work off the table. You will also notice my trusty friends in the picture too – Jerry and Dame. Dame has her own beanbag and blanket under my desk that she settles on and keeps my feet warm and Jerry is always wandering around somewhere in the house and quite often he takes a stroll across my desk as I’m working – especially around feeding time! Vanessa : Photo 1 is supposed to be my writing space. We have a dedicated office in the house and for a while it was all mine with a big desk and built in bookshelves … Then my husband started doing lots of technical stuff with music and video for work and for fun and slowly took over the room with keyboards and wires and strange machines and now there’s not even room on the desk for a notebook. Photo 2 is now my writing space. The dining table. And even this is rarely my space – as the dining room is next to the conservatory which acts as a play room, the toys tend to spill over so I end up sharing space with Barbie dolls and jigsaws. Liz : I tend to be pretty useless with writing at home, so usually take my laptop to my local Starbucks instead where I can find the perfect balance of writing and people watching. On the time that I do write at home, it’s sat at my desk in the picture where I work through scrawled ideas in tatty notebooks and drink copious amounts of wine or tea whilst listening to music. Writing to Plan – Penny Hike, Map or GPS? As I’ve been planning my new novel this last week or so, I couldn’t help wondering how others approach this phase of the writing process. When I hear writers say that they ‘write into the mist’ I can’t help but admire them, it’s something that I could never do. To me that would be like going on a ‘Penny Hike’ where every time you get to a junction, you flip a coin to see which way to go. Others I know like to plan in detail, they plot and plot until they have every scene in every order and know exactly where they are going. They plan their writing journey with the precision of a GPS navigation system. Sadly, I’m not that organised. I’m probably somewhere in between. I do like to plan and I like to gather together scenes that I think may fit into my novel along the way but not in huge detail. I have a pretty good idea where it’s all going but am prepared to take a detour now and again. I see it rather like planning a journey with an Ordinance Survey Map, knowing that you are starting at ‘A’ and going to end up at ‘B’ – albeit eventually. Having said that, I do like to have a good handle on the time-line and it’s something that evolves as I write. A bit like a travel journal. I like to know the month my novel starts, if possible the week and the day. I also like these days to be a true reflection of days in real life. For example, if my heroine works at the Post Office, I can’t have her going into work on a Bank Holiday Monday, so I like to get the calendar out and check. I’m not entirely sure every reader or, indeed, any reader would go and check themselves but it would be just my luck that someone reading it will know that date – maybe it was their birthday or wedding anniversary – but they will know that it was a Bank Holiday and, therefore, the Post Office was shut. To help navigate this calendar minefield, when I wrote my last manuscript I devised a timeline. I simply got several sheets of A4 paper and wrote out my own calendar. Then I put a circle round the days when key events in my novel happened, together with a couple of words to indicate what that key event was. That way when I wrote something like, ‘It had been ten days since she had heard from him’, I know that it is definitely ten days, not nine, not eleven, but ten exactly. I have a thing about continuity and this is how I keep it going. Also, it can give a quick overview of key events so if anyone comes back to me and queries something, I can instantly refer to it. I’d love to know how everyone does their planning. Do you Penny Hike, take a map or get the GPS out? 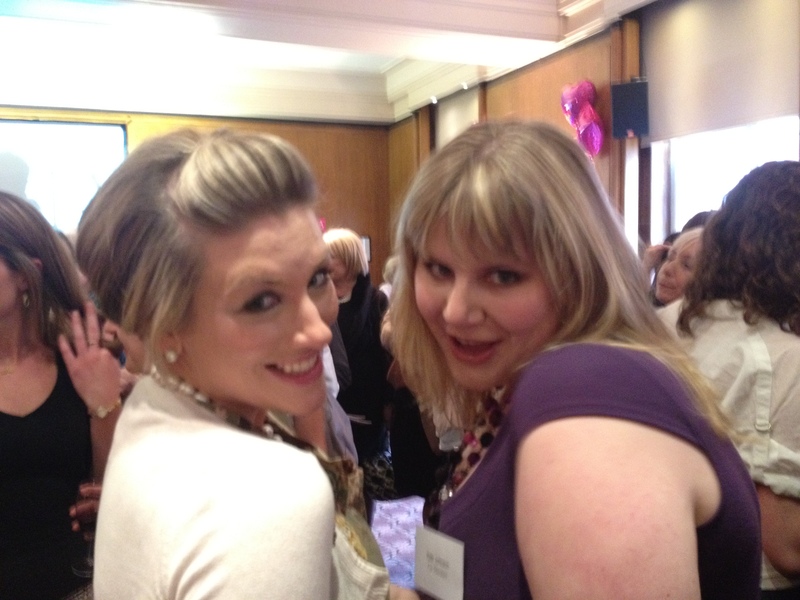 I’m pleased to welcome onto the blog today my agent, the lovely Juliet Mushens of PFD. It was around this time last year that I travelled to London to meet Juliet for the first time, walking into PFD’s Covent Garden offices, hands shaking and knees definitely knocking. 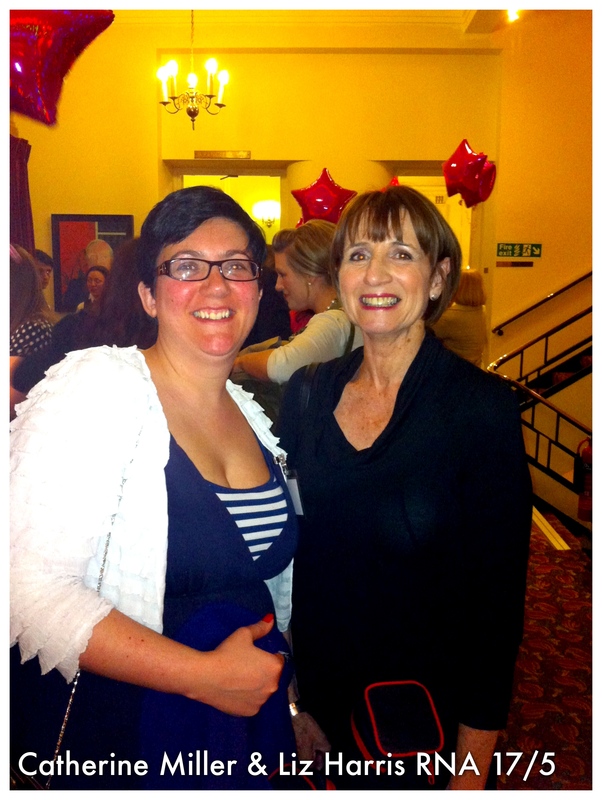 But I needn’t have been nervous – Juliet greeted me with cupcakes and enthusiasm and amazing editorial advice. Before becoming a literary agent at Peters Fraser & Dunlop, Juliet worked in fiction marketing and editorial at HarperCollins. I managed to catch her with a (very rare) spare moment and she very kindly agreed to answer some questions from the Romaniacs. What are you looking for at the moment? I am looking for lots of things: fiction with a historical setting, a YA love story, a women’s fiction book that properly makes me laugh and a blood-spattered serial killer thriller. How important is the covering letter and what should it include? SO important! Treat it like the cover letter for a job – make it 1 page, give me a brief pitch of your book, why you’ve sent it to me, and a couple of lines about yourself. Proof-read it then proof-read it again. Make it punchy, intriguing and exciting. Think of what you see on book blurbs and apply that to your book. Do you find most of your clients from the ‘slush pile’ or through other means? My authors are a real mix but the vast majority of my fiction clients came from the slush. It can be a real goldmine. It’s very tempting as a writer to send agents sparkly cupcakes. What’s the strangest ‘extra’ you’ve had with a manuscript? Someone sent me a picture they’d drawn of me before. It was creepy. And wildly inaccurate. If a writer had been rejected, is it acceptable to send their next MS to you for consideration? Absolutely! Especially if I wrote you a personal note with the previous one. But even if not, it shows you’re tenacious – and maybe this book will be the one. How do you recognise a well written piece from a short extract? How much of a writer’s three chapters do you read before deciding if you want to see more? I reckon I can tell within 10 pages if I want to read the rest. Do you read the synopsis before or after the three chapters? Confession time here: I never read it. I will just read the cover letter and sample chapters. From start to finish, of what does your working day consist? Which is why submissions can sometimes take a while to be answered. What’s the worst thing a new writer can do that will instantly upset a prospective agent? Please don’t call me. I’m very busy and it will be an uncomfortable experience for both of us. I will read your manuscript and get back to you, but if you’re already being high-maintenance and I don’t even represent you, warning bells will ring. 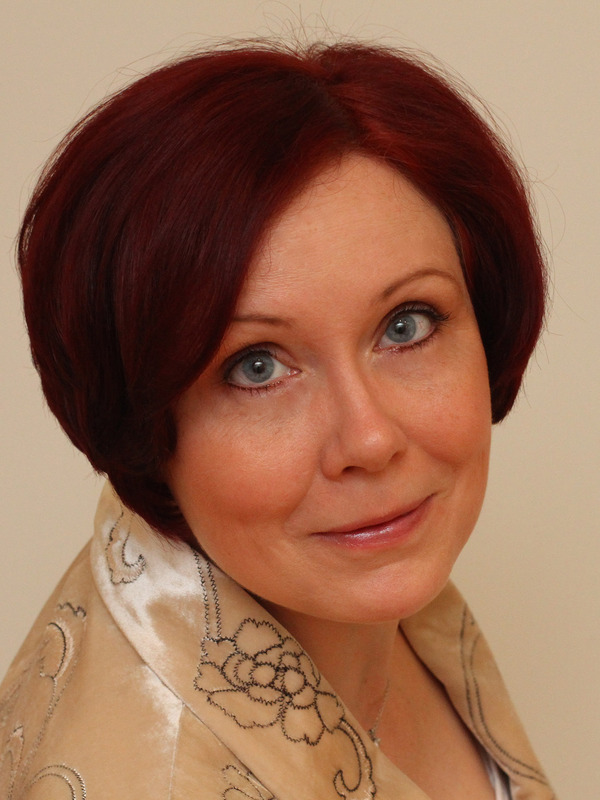 What’s the best thing a new writer can do to get the agent onside? 1) be a great writer and 2) be a nice person. How important is it that the writer and the agent get on? Everyone has different opinions on this but for me it’s crucial that we have a good personal relationship. We need to like each other and feel that we’re working as a team. 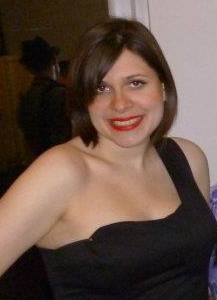 What are the highs and lows of being an agent? Sometimes being the middle-man is difficult, and it’s heartbreaking when you can’t sell a book. 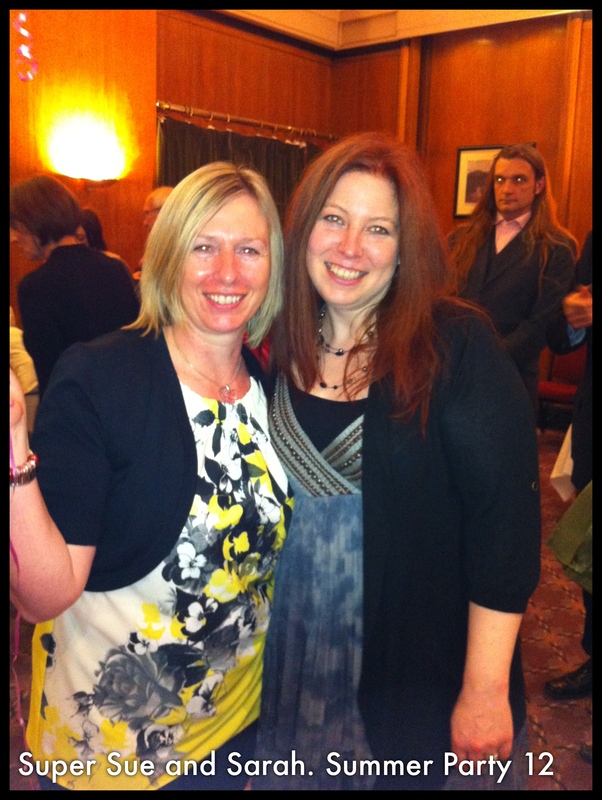 But nothing beats the moment when you call an author and say ‘I’ve had an offer for your novel…’. Absolutely nothing. It was with slight trepidation that I walked toward the hotel bar. What would they be like? Would they like me? It was at this point I heard the laughter coming from inside the bar. 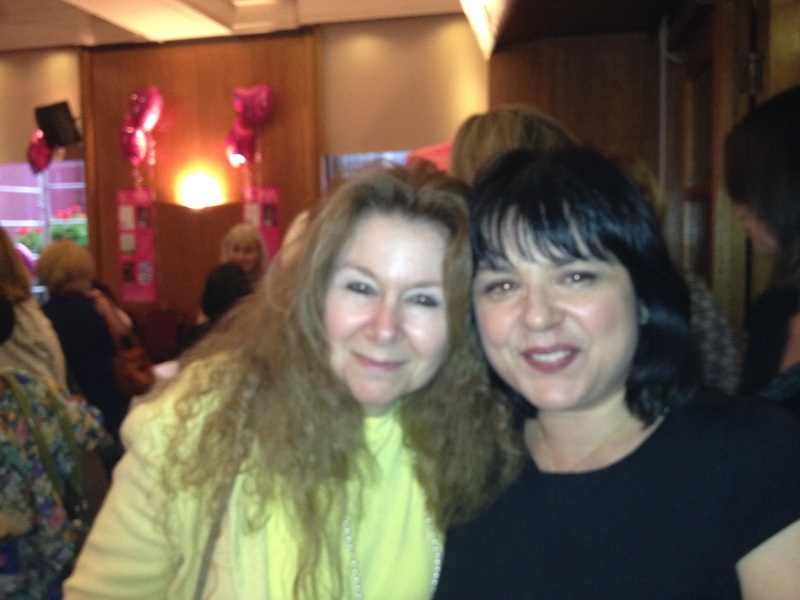 Thankfully I recognised a familiar voice – it was Vanessa, who had suggested I meet up with the Romaniacs. This gave me some courage. I walked boldly into the room and was immediately greeted with warmth and friendship. I could tell that the evening ahead was going to be a lot of fun. It all started at the restaurant. Sitting down and opening the menu I realized that I had left my glasses at the hotel. Seeing as I am as blind as a bat without them, this was going to be tricky! Fortunately Debbie came to my rescue and read the menu out to me. I have to say she did a great job, and I didn’t have to go hungry, which is a good thing as we were cracking open a couple of bottles of wine to get the party started. There was much merriment throughout the meal, and I think by the time we left there may have been a few sighs of relief from the staff! Into the taxis we clamoured. We were on our way to the party. The taxi ride was a lot of fun. 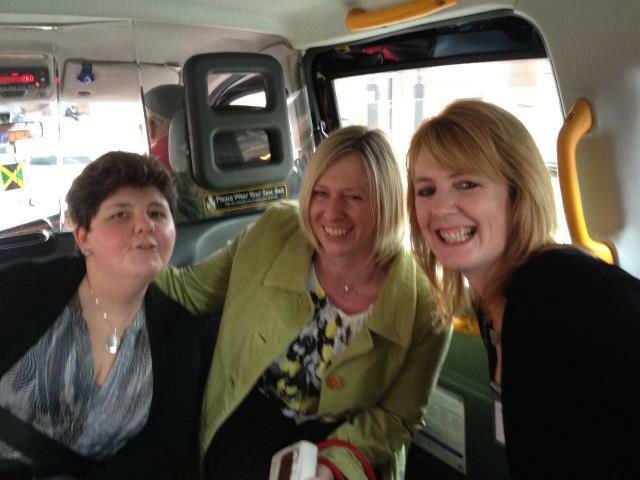 I was in the cab with Debbie, Sue and Lucie. Yes I have to confess it was me who took the photograph in the cab. I think it must have taken me about three tries before I finally got a picture that looked alright. I am not sure if it was the fact I had no glasses or the wine had started to take effect. No it was definitely the glasses. Yes ladies I will tell you now that I absolutely loved that taxi ride. So did the driver. It was official. The ladies had bestowed upon me the title of honorary Romaniac for the day. So it was with pride that I walked into the party with my new friends. 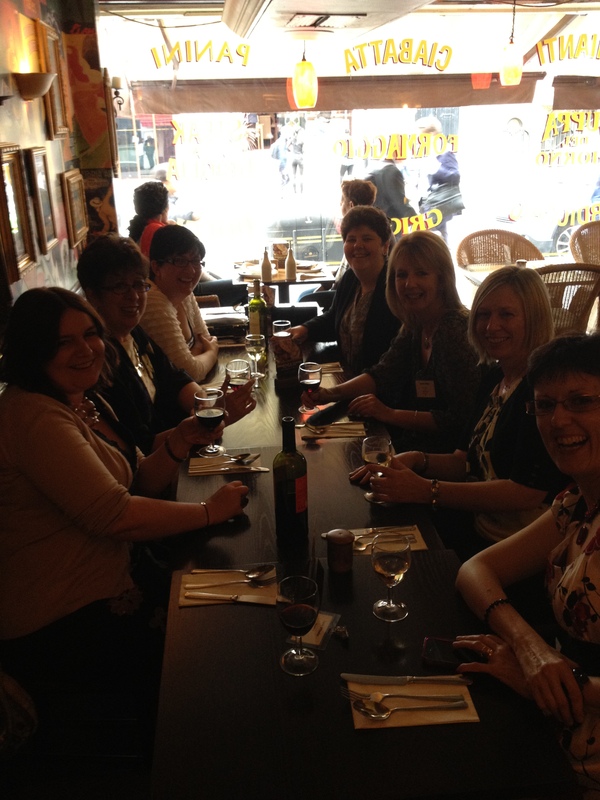 It was the start of the evening and it was lovely to meet up with people I knew from last year. 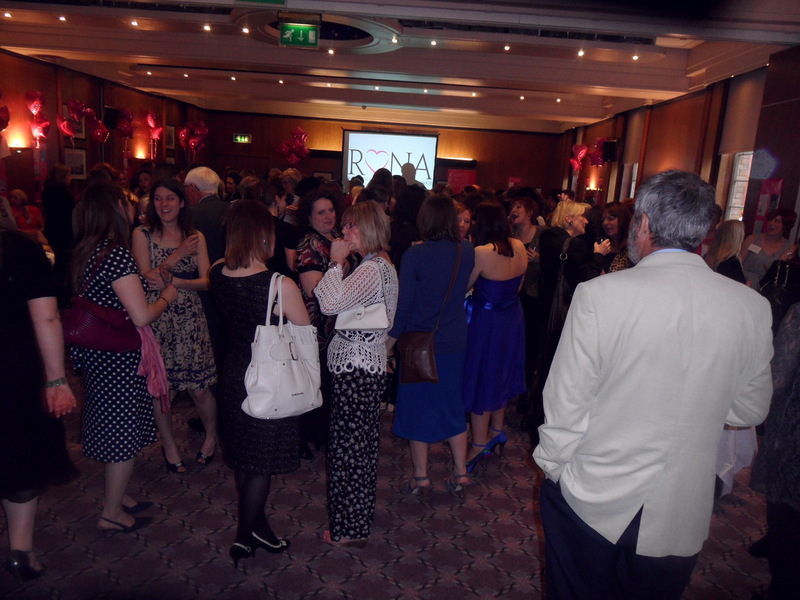 There was a definite buzz in the air as the awards were being announced. It was a wonderful to be a part of such an occasion. It was much later in the evening that I began to appreciate how crazy these ladies really are. It was nearing the end of a fantastic evening that the Romaniacs broke out into song. It was an amazing rendition of HEY BIG SPENDER. This really confirmed to me that these were definitely my kind of people. 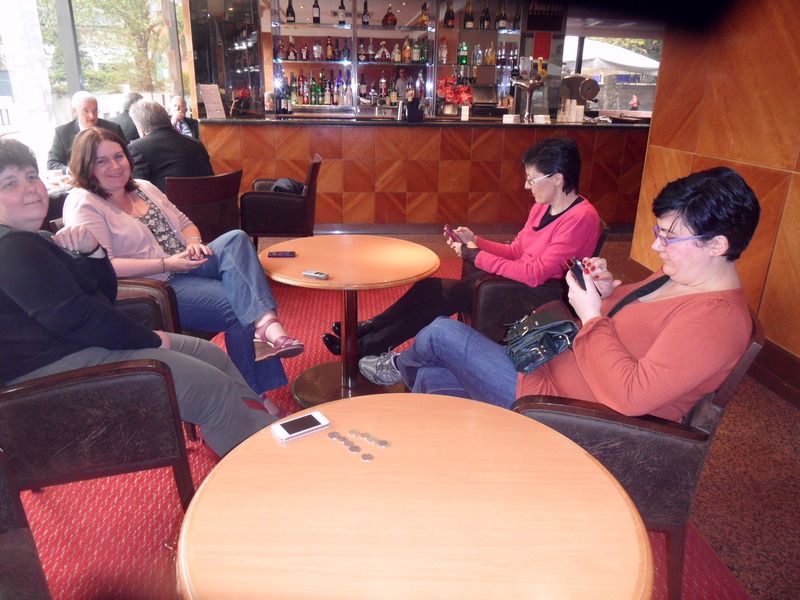 I have to say how much I enjoyed my time with these lovely warm ladies, who welcomed me with open arms into their group. All I can say is I have loved every minute of my time with them, and I look forward to another time where we can meet up. Thank you so much everyone for taking me under your collective wings. 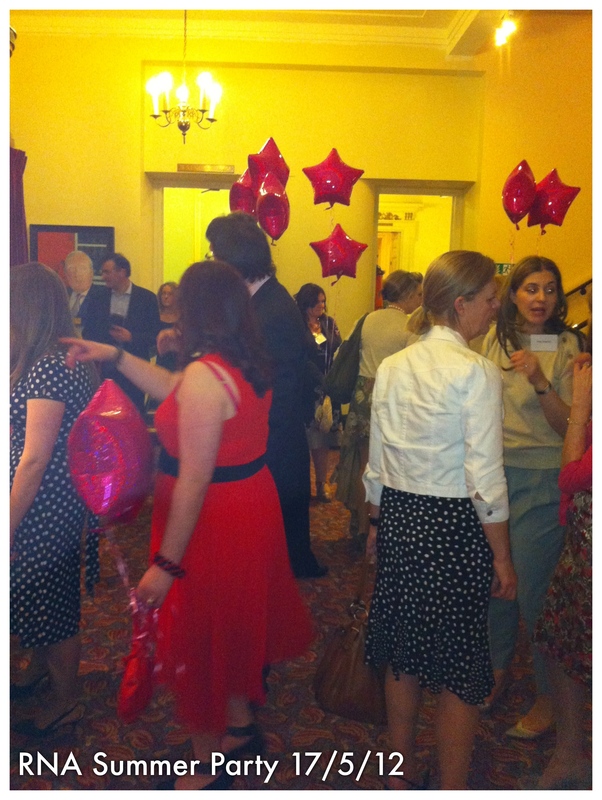 We are exhausted, so without further ado, here are a few photos taken by the Romaniacs at this year’s RNA Summer Party. 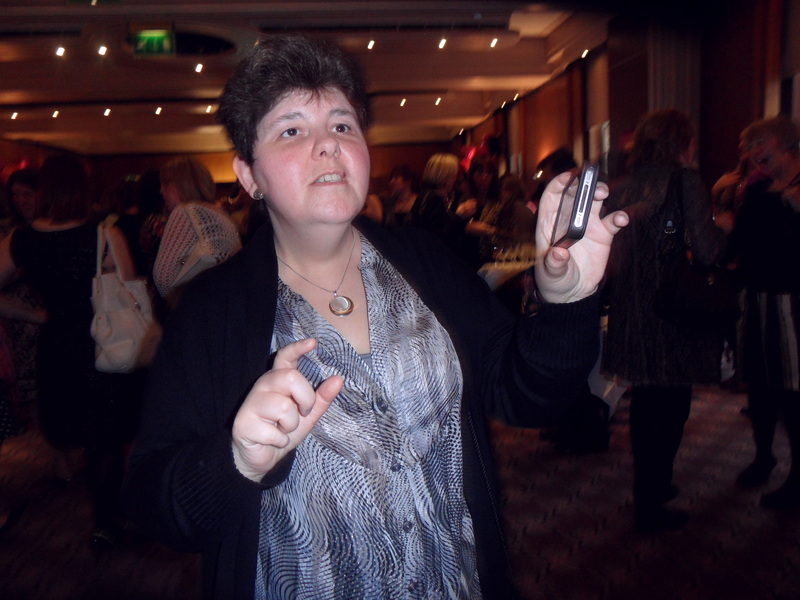 The lovely Lorraine – our official photographer for the night! 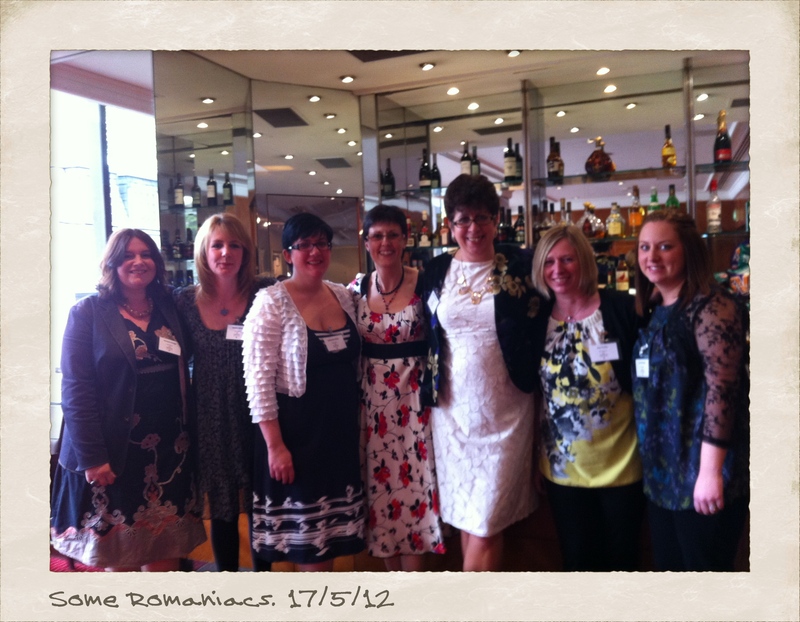 The Romaniacs hit the town! Yes, that’s right! Us Romaniacs were allowed to take the cuffs off, step away from our desks and glam it up in London for the RNA Summer Party yesterday. And boy what a day it was! Here’s the lowdown on how my day went. I arrived at Liverpool Street station around 1pm to meet fellow Romaniac, Sue. I had previously expressed my concern to the other Romaniacs about travelling alone in and around London – I could quite easily get lost going to bed at night if I don’t concentrate – and so in true, supportive Romaniac style, Sue took a slight de-tour on her route and came to meet me at Liverpool St. After a little incident with her ticket being voided because she came outside the barriers to meet me (ooops!) 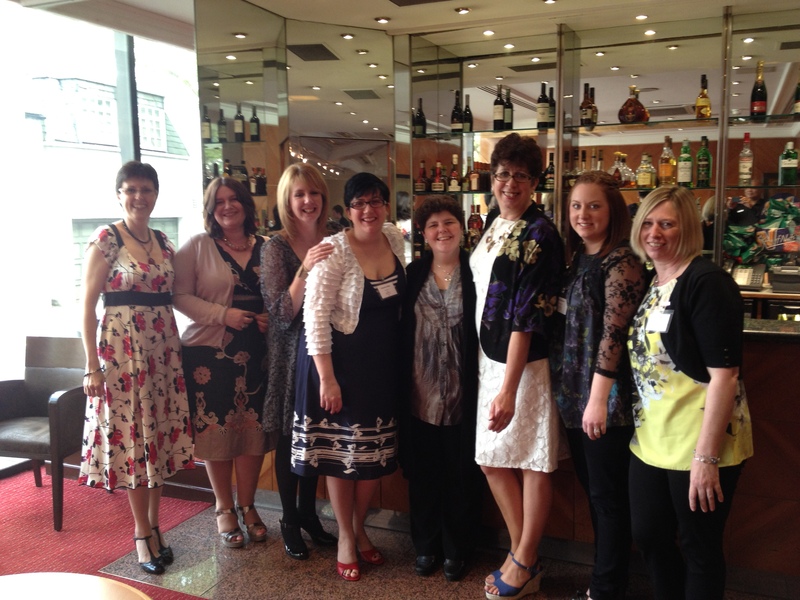 we made our way to the hotel, where we met up with more Romaniac buddies; Debbie, Celia, Laura, Vanessa, Catherine and honorary Romaniac for the day, Lorraine. Unfortunately we were still one short in the form of lovely Liz, as she was still en route home from Cuba, but 8/9 is the most we have managed to get together thus far, so this was a big event for us. 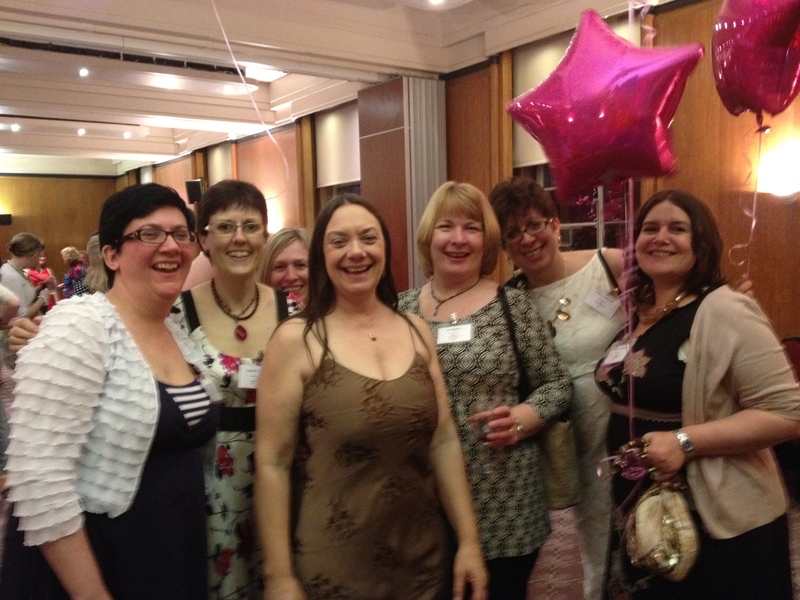 Our next event like this is the RNA conference in July, where there will be 7/9 of us again! 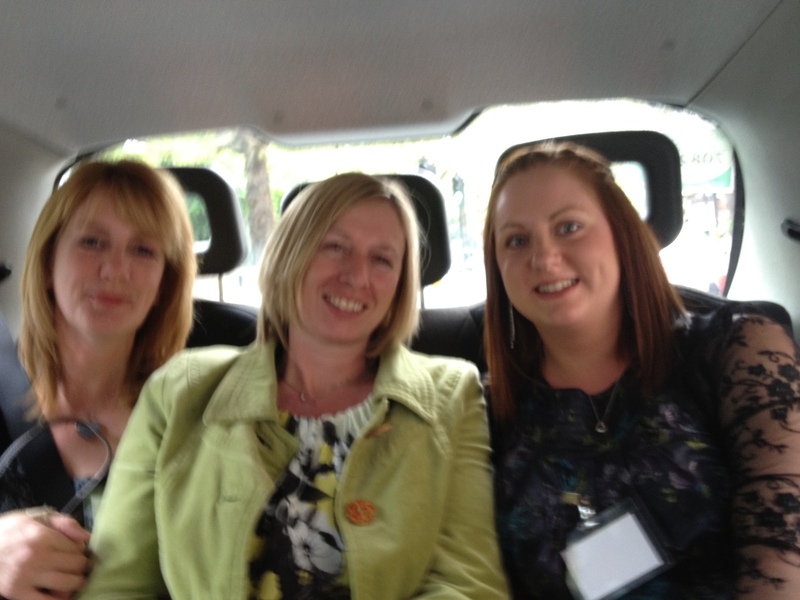 Debbie, Sue and myself in the cab on the way to the party. Then came the time for the party. I have to say, I was a little nervous before going in. 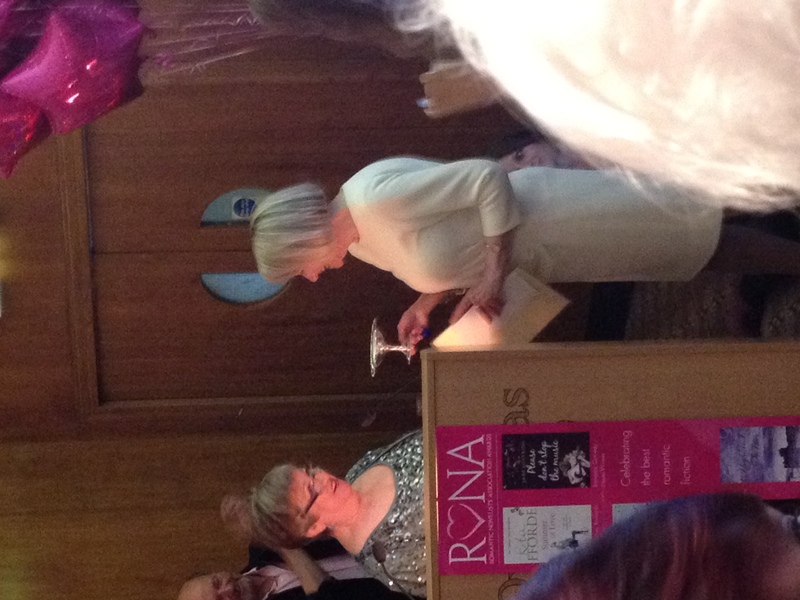 I’m not even sure why because I have not yet come across a person who has made me feel anything other than welcome at the RNA events. But it had been a long time since I had seen many of my friends but within a few minutes of walking in, I felt completely at home. 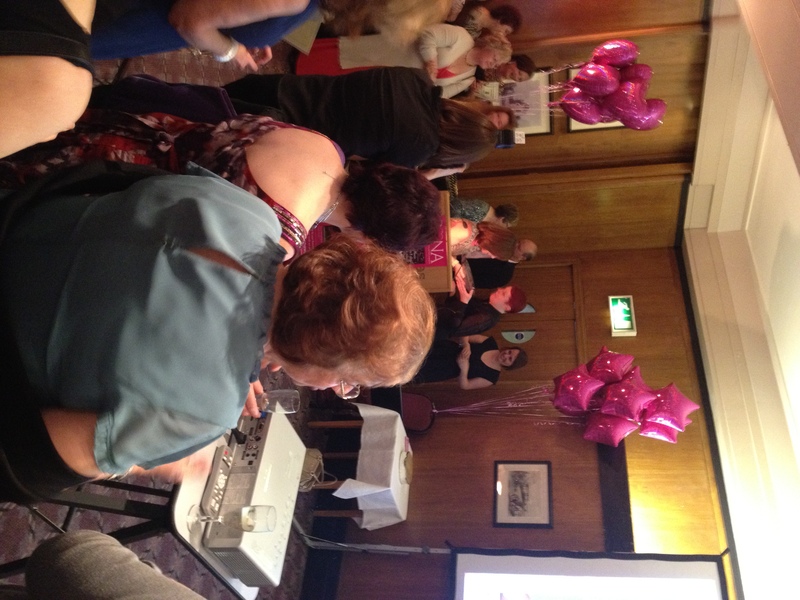 Mingling, catching up with old friends, making new friends, congratulating award winners – this is just a snippet of what goes on at an RNA event. 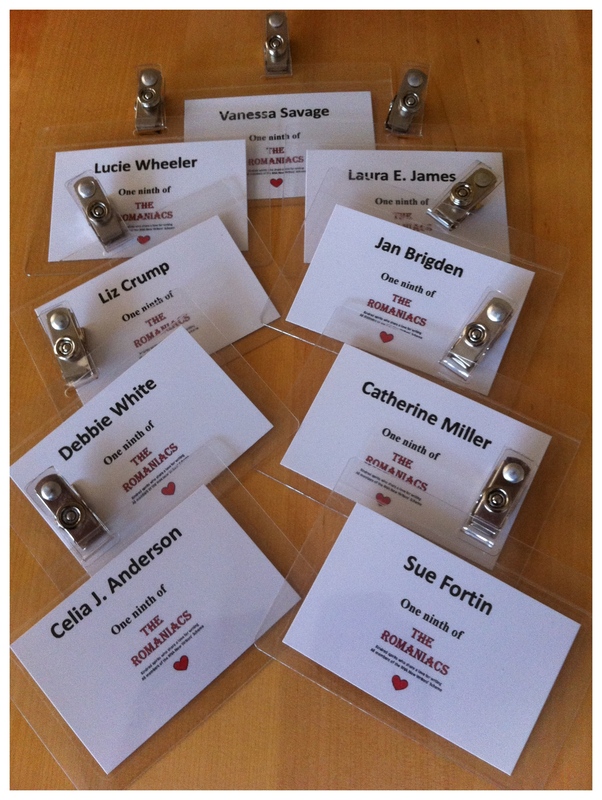 I am so proud to be part of such a fantastic organisation like the RNA, and similarly, I am absolutely honoured to be part of a fantastic, supportive, encouraging group of people who have become lifelong friends of mine, my fellow Romaniac buddies. 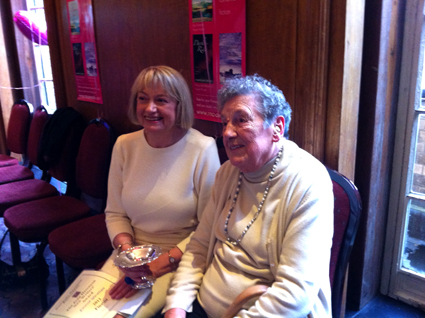 I would like to say, on behalf of us all, a massive CONGRATULATIONS to Evonne Wareham, winner of the Joan Hessayon Award with ‘Never Coming Home’, and also Jane Lovering, winner of the RoNa award with ‘Please Don’t Stop The Music’. Both fantastic books and deserved winners. And a clean sweep for ChocLit so congratulations to the ChocLit team, also! 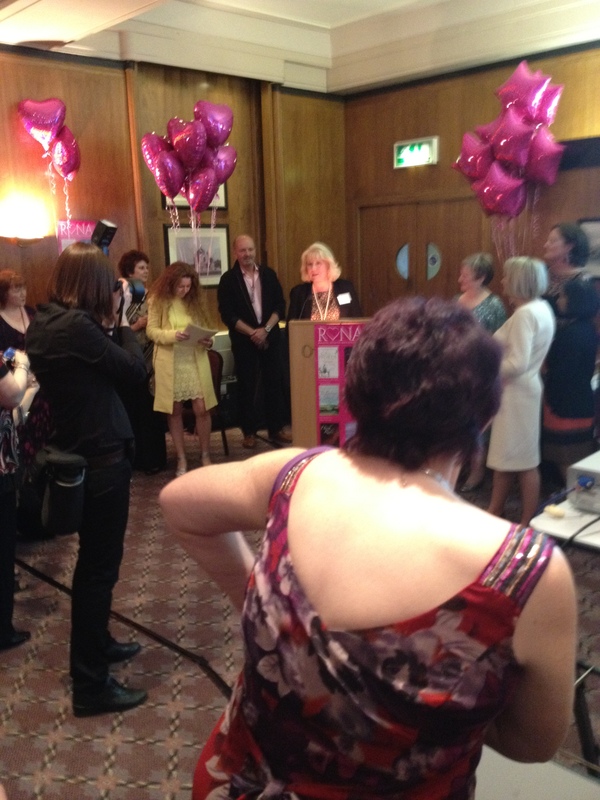 And of course a huge well done to all those shortlisted in both awards – that is a big achievement in itself. 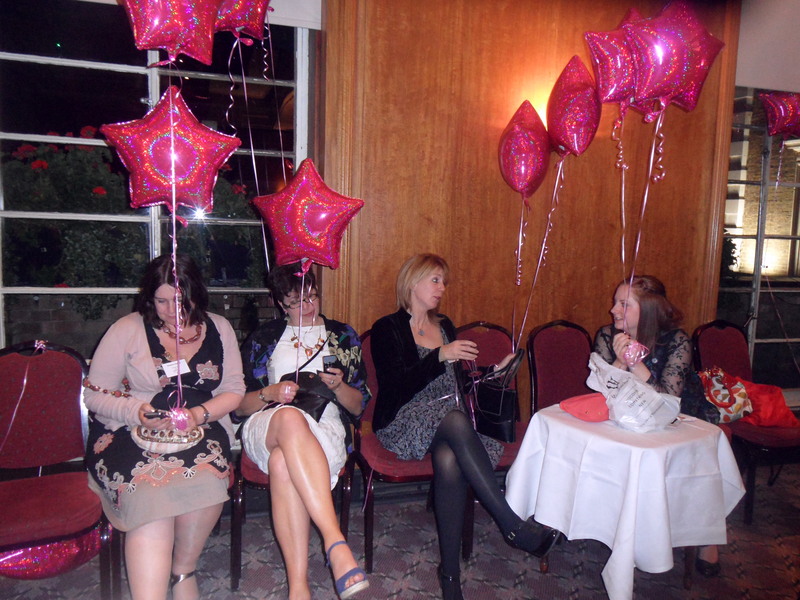 The party was thoroughly enjoyable with many, many laughs. I hope to see some of you at the Conference in July to resume the fun! I shall now leave you with just a few of the photo’s that I took last night. More will be uploaded to my Facebook later on. Apologies for any that are a little blurry. Charlotte Betts, winner of last year’s Hessayon Award, giving a speech and passing on the cup. Me Before You. A Romaniac Review. I had read such good reviews of Me Before You, I was intrigued as to how this book achieved a universal ‘must read’ status. I followed a link on Facebook to a video interview with Jojo Moyes, hosted by Richard and Judy, which I watched with intent. I found the author an engaging and thoughtful guest, which served to pique my interest further. The love story revolves around Will Traynor, a quadriplegic, and his reluctant carer, Louisa Clark, a woman of twenty-six, who has been launched on her unexpected caring path, having lost her job at a local tearoom. It is the success of the rival tearoom at the tourist hotspot, the town’s castle, which has brought her to this point. Ironically, the castle is owned by the wealthy Traynors. Will, a once active and virile man, is frustrated with the life he now leads, the majority of his body paralysed following an accident. When Louisa realises what he has planned for the future, she enters into an unlikely and difficult arrangement with Will’s mother, in the hope Will can be persuaded to change his mind, but Louisa has a little less than six months in which to do so. The situation is further complicated by her growing affection for her boss. Will Louisa succeed? Will the path of true love take them to freedom or lead them down a dead end? The first thing that struck me was the choice of name for the hero – Will – an apt name. He is wilful. The second thing was how quickly I became absorbed in the story. It is well structured and flows with the grace of the Danube. Finally, I noted the hero is not typical of a contemporary romance; for the most part, he is in a wheelchair and has no desire to engage with people. But this is the story of life and the wonders and challenges it holds and Jojo Moyes handles the complex subjects with great sensitivity, humour and understanding. I thank her for having the courage to write it and I applaud her skill in delivering it. 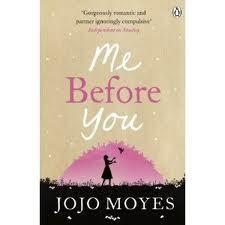 This is the first of Jojo Moyes I have read, but it will not be the last. Me Before You will remain a very special book. Gorgeous book – I loved it and found it heartbreaking and uplifting at the same time. I thought the characters were beautifully portrayed. I fell in love with Will Traynor on Louisa’s birthday – for the present he gives her and his line to Patrick, Louisa’s boyfriend, as he leaves. That was the moment I stopped seeing the wheelchair and began seeing a romantic hero. It was probably around the same time I realised this book isn’t really about Louisa saving Will, it’s about Will saving Louisa. Naturally, we do not wish to give away the ending, but we would love to know your thoughts on Me Before You?